It’s only natural that we all want to elevate our experiences of the good things in life. We want to take care of our families, offering our spouses, our children and even our parents the blessings we think they deserve. And so, we set goals in our desire to be successful and to acquire those good things. It’s a safe bet that it all stems from an archetypal longing for the Garden of Eden we humans had before the fall. Relatedly, it’s also very likely, connected to an aching desire for Paradise, whose seed God has implanted in us and expected us, through our struggles, to nurture into fruition. Because of that, there’s almost no way to avoid the desire to aspire towards something better. In fact, there’s probably something wrong with us if we aren’t aspiring toward some measure of improvement or success. But what exactly is success? To some it’s financial, to others vocational. Still others measure success by popularity, or family happiness, or health. And that’s not all that unusual. You see, the evil-one continually exploits our desire for success, by wrapping corrupted and unreliable desires in packaging that looks innocent, or even good, and convincing us to expend all our energy on them. He sells us self-centered goals, motivated by comfort, greed, envy, guilt, fear, or pride and tries to pass them off as authentic success. Each counterfeit promise is worded slightly different, but what the evil-one promises for each of us is basically the same: “Climb this ladder and all your desires will be fulfilled,” or “Strive toward this goal and you’ll finally attain happiness.” Whatever it is that we think we want; the devil ingeniously promises it as a leg-up toward what will satisfy our deepest need. And since none of those aspirations look all that dangerous from the ground, we climb, with no further investigation to test for authenticity. But how does God measure success? Because, even if we temporarily entertain the notion that we can be gods unto ourselves, deciding for ourselves what our destiny of success should be, it’s a fool’s errand. God’s is the only measurement of success that matters, because only His is timelessly enduring. Additionally, as the One who created us, He knows what kind of success will actually bring life to us and fulfill the purpose for which He created us. This Sunday, we give honor to the life and work of Saint John Climacus. The Church gave him that moniker, “Climacus” (meaning “of the Ladder”), because he wrote a remarkable work called, the Ladder of Divine Ascent. In that work, Saint John Climacus shows his monks how, in thirty steps of arduous self-assessment, they can learn to cast off the ways that they seek to be gods unto themselves, gradually ascending toward Christlike virtues of Christian love. Saint John of the Ladder tells us that true success can only be found in our growing in the likeness of God. This Sunday we’re asked to wake up and realize that many counterfeit ladders have been strategically placed all around us by our enemy to continually draw our attention away from the Ladder leading to Paradise. This Sunday the red “check-engine” light comes on, directing us to reconsider the direction we’ve taken. Wisdom! Let us be attentive. The observance of Saint John’s Ladder is placed here this Sunday, by the Church, as a reminder to stop and reflect. So what kind of success does God bless? He honors and blesses your goals that are motivated by a desire to love Him and others. It’s all about our relationship to Him and others. If we aspire towards loveless, self-absorbed goals…then we’re heading in a direction opposite of our Lord. And such Godless goals have consequences which the evil-one rejoices in. They bring our marriages to ruin. They distort our relationships with children, and our friends. We were created in the image of God, which means we were built for relationships. It’s about learning how to love.” “Do everything in love” (1 Corinthians 16:14). The number one goal in each of our lives should be to learn to really love — God, our family, neighbors, and the unlovable. That makes us more like God, because God is love. And if we want to climb the Ladder of Divine Ascent, then we align our goals with those leading to a life in Christ. We go to Church…we receive the sacraments regularly…we pray to God ‘in spirit and truth’… we read the Gospels and the writings of the Church Fathers and because of that we ultimately learn to grow-in and bear the fruit of love. Maybe you’ve seen a climbing wall, or tried one yourself. 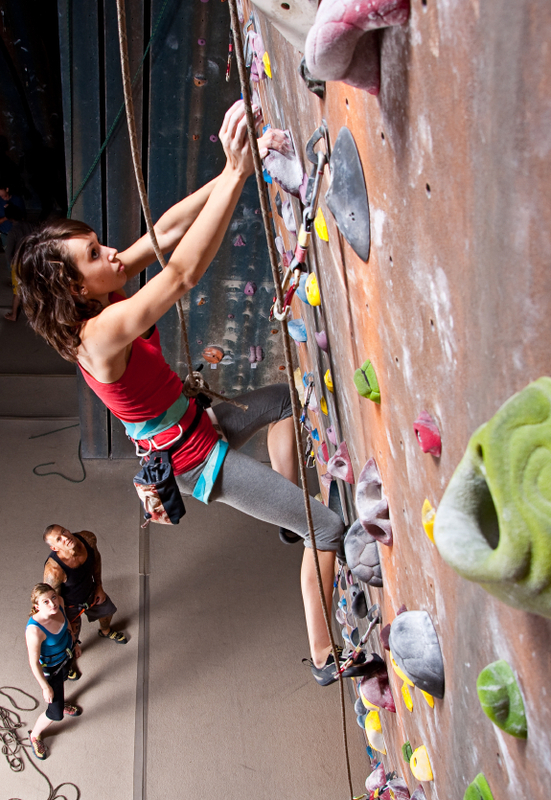 A climbing wall is a high structure with footholds and handholds placed at strategic points from the ground up…ascending to a deck at the top. Some of those walls are pretty tricky, since they were designed in such a way that only one pathway leads to the top. Other climbing walls are tricky in other ways, including some hand-holds that will spin under your weight or fool you into heading towards a dead end. The instructor on the ground is there to shout instructions as you climb, leading you up the right path. On occasion, you might even be asked to leap to a hand-hold that the instructor wants you to use, when another hold is much closer and seems much safer. The fact is though, if you don’t trust the instructor who’s there to guide you, your chances of reaching the top are greatly reduced. But if you trust that your instructor actually knows what he’s talking about and you follow his lead, then he’ll lead you to where you’ll need to get. While making our way upward in our Divine Ascent, The King of the Glory sees each of us climbing today. He’s our instructor…our guide, asking us to trust Him. He’s leading us to exactly where we need to get. He has a “good, pleasing, and perfect will” for your climb (Romans 12:2). He promises, “surely I am with you always, to the very end of the age” (Matthew 28:20). When we feel ourselves slipping and losing our grip in life, well that’s when we need to follow the example of the father in this Sunday’s Gospel reading, who said, “Lord I believe, help my unbelief” and continue our climb, trusting, in faith that our Lord, Jesus Christ is the only worthy destination. But the amazing thing is, that the Lord’s not just waiting for us at the top, He’s also there below, giving instructions about the next hand-hold of love to grab, and He’s also there climbing along-side us each step of the way. He’s everywhere present and filling all things.He’s always with us as we aspire toward Him.